Patek Philippe is known for reaching the technical limits of watchmaking. 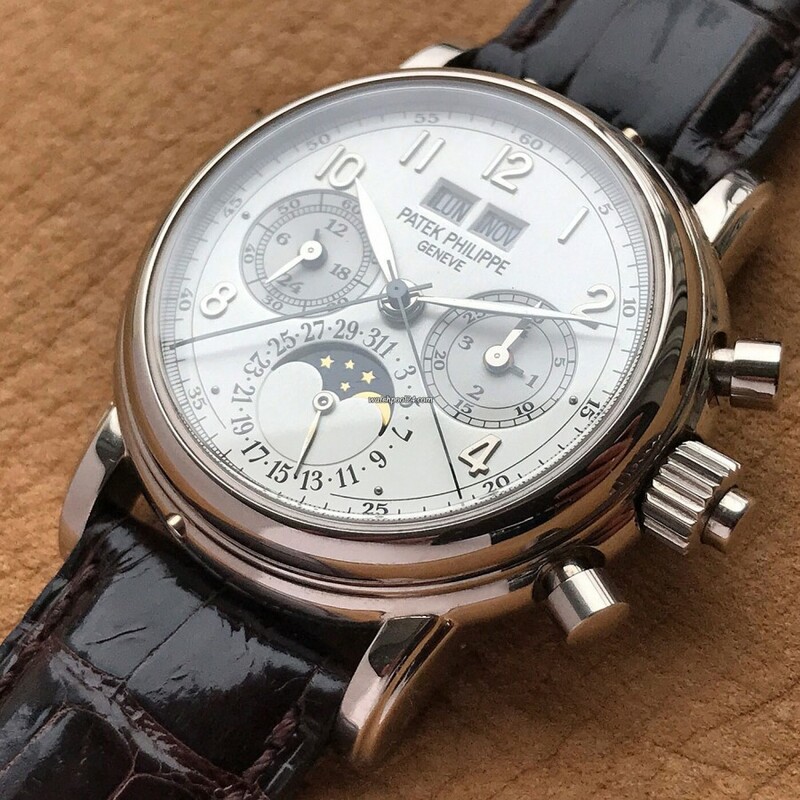 This Patek Philippe Grandes Complications Reference 5004 in white gold from 1996 is an excellent proof of this. It is a perpetual calendar with a split seconds chronograph. The split seconds complication controls two hands - the chronograph hand and the split seconds hand. By pressing the pusher at 2 o'clock you start the chronograph and the two hands start to run simultaneously. The split seconds hand can be stopped by the pusher in the crown, but the chronograph hand continues running. Thus, split time can be measured without losing time for resetting the chronograph. As soon as the crown button is pressed again, the split seconds hand immediately catches up with the chronograph hand. The perpetual calendar takes into account not only the months with 31, 30 and 28 days, but also the leap day of 29 February, which occurs every four years. In the two apertures at 12 o'clock the day of the week or the month is displayed in Italian. The date is shown in the sub dial at 6 o'clock. The sub dial at 3 o'clock indicates the leap year. The small second with the 24-hour display is positioned at 9 o'clock. Moonphase is at 6 o'clock. Due to the sapphire case back you can always take a look at the beautiful movement. It is the in-house and extremely complicated CHR 27-70 Q caliber by Patek Philippe. A replaceable case back in white gold is available. - Leather wallet by Patek Philippe. This particular specimen was hardly worn and is in mint condition. The whitegold case is unpolished and the dial is absolutely flawless. The watch comes with a beautiful crocodile leather strap and a white gold clasp. The white gold version of the Reference 5004 is rarer than the platinum version for an interesting reason. When the reference 5004 came out in the 1990s, the price difference between the platinum and white gold variants was relatively small. As a result, the platinum version was ordered more often. This in turn means that the white gold variant was produced in much smaller numbers. All in all, this perpetual calendar with a split seconds complication is a remarkable masterpiece made by Patek Philippe. It's a watch with an inexplicable attraction and amazes every watch enthusiast.